This post will show to create and configure your SQL ConfigurationFile.ini for unattended installation or deployment(s). For this exercise, I’am using Windows Server Technical Preview: http://www.microsoft.com/en-us/evalcenter/evaluate-windows-server-technical-preview and make sure that the .Net Framework 3.5 Feature is installed. Run the setup.exe file and go through the normal installation process. To do an unattended installation of SQL Server 2014 here’s a sample syntax: Setup.exe /ConfigurationFile=ConfigurationFile.INI or to specify service account passwords at the command prompt instead of in the configuration file: Setup.exe /SQLSVCPASSWORD=”passwordhere” /AGTSVCPASSWORD=”passwordhere” /ASSVCPASSWORD=”passwordhere” /ISSVCPASSWORD=”passwordhere” /RSSVCPASSWORD=”passwordhere” /ConfigurationFile=ConfigurationFile.INI. 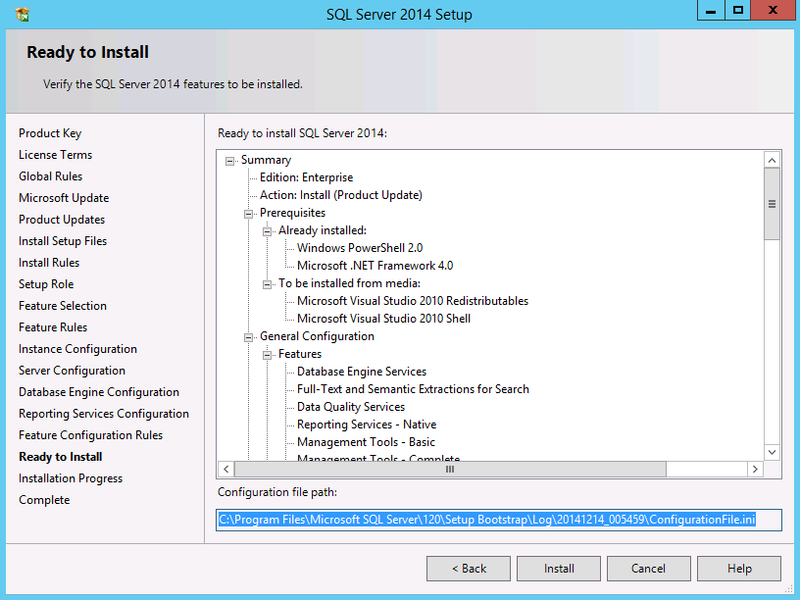 For more information about SQL 2014 Config file and unattended installation go to Install SQL Server 2014 Using a Configuration File and Install SQL Server 2014 from the Command Prompt.